Your Enterprise Video Streaming (EVS) portal page can be set as the landing page for all your viewers. This is especially useful if you have more than one channel, and possibly more than one audience within your organization. Account logo: This is the logo that you can choose to represent your EVS account. This logo will appear both here on your portal page, and also on each individual channel page (above the channel's individual logo). Clicking on this logo on the channel page will return the user to the Enterprise Video Streaming Portal page. 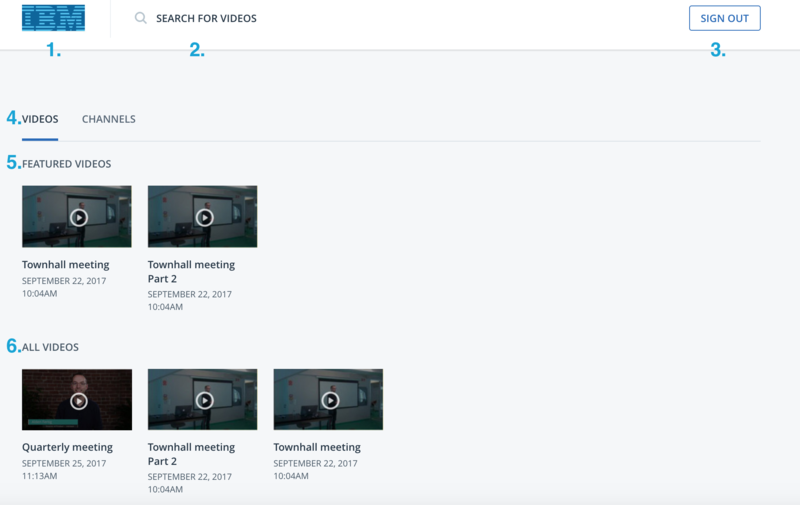 Search field: The search field on the portal page will allow a user to search for any video that they have access to on your account (dependent on how you have set up access control per channel). The search will function with keywords found either in the title or the description of an individual video. Sign out: This allows a user to sign out of their SSO or authorization instance. Videos/Channels tab toggle: These two tabs allow the viewer to select between all videos available, or all channels. Featured Videos: The Featured Videos row allows you to highlight selected videos for your viewers in a row above all the other videos available to them. All Videos: The All Videos row shows all videos available to the user. 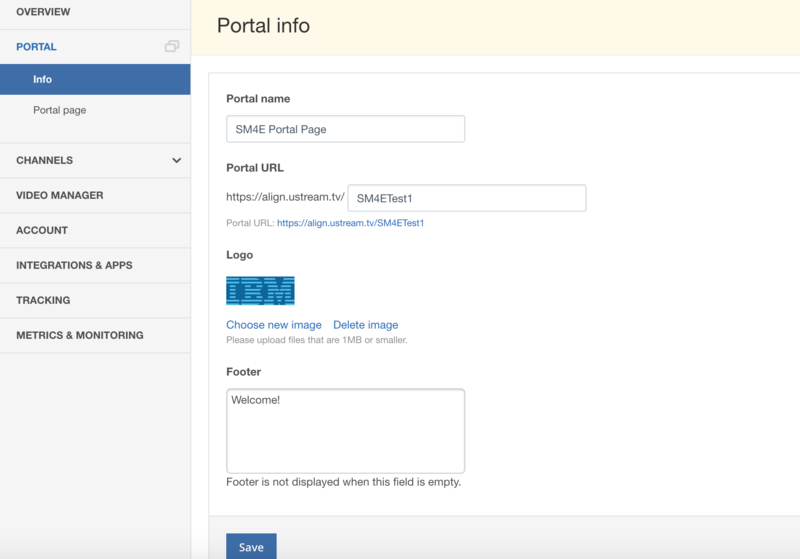 Setup of your EVS Portal page is handled from your dashboard. Log in to your account, and select Dashboard from the dropdown menu under your login logo. Once you are on your dashboard page, click on 'Portal' from the left hand column. You will see two options under the Portal tab: Info and Portal Page. On the Info tab, you can choose to re-name your portal page, or reset the URL that users access it from. You will also see a clickable link that will take you to your portal page, and also highlights the current URL. Below this, you will see an option to choose a new image, or delete the current image, that you have in place for your portal page logo. Please keep in mind that your logo should be 1MB or smaller. Once you have made any changes you wish, click save. 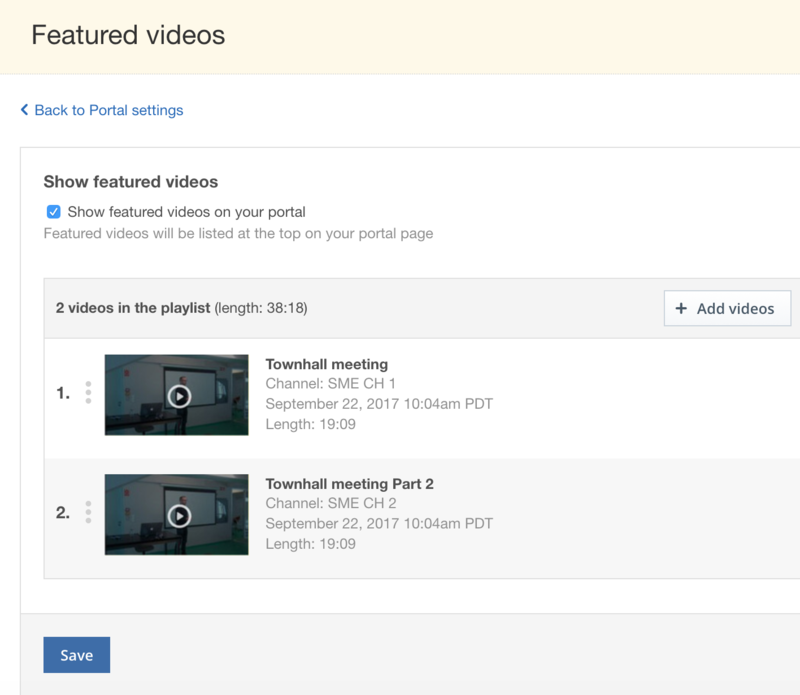 On the Portal Page tab, you can set up a cover image for your portal page as well as set your selected videos list. Click Settings next to the cover image row to select an image to use as a cover for your portal page. The image you select should be 2560 x 852 pixels, and needs to be present on your local computer. To create a featured videos list, click Settings next to Featured Videos. On this tab, you can see that you can toggle the visibility of your featured videos list on and off with a checkbox. You can also choose to add videos to your featured videos list by clicking the "+ Add videos" button, and delete any individual video currently on the list by hovering over the row that contains the video and clicking the trashcan icon that appears to the right. (there will also be a play button that allows you to preview the video). When you are finished selecting the videos you wish to appear, click save.